Red gold, green gold – a ground-breaking initiative has found a way of changing the colour of the world’s most iconic precious metal. A University of Southampton team have discovered that by embossing tiny raised or indented patterns onto the metal’s surface, they can change the way it absorbs and reflects light – ensuring our eyes don’t see it as ‘golden’ in colour at all. 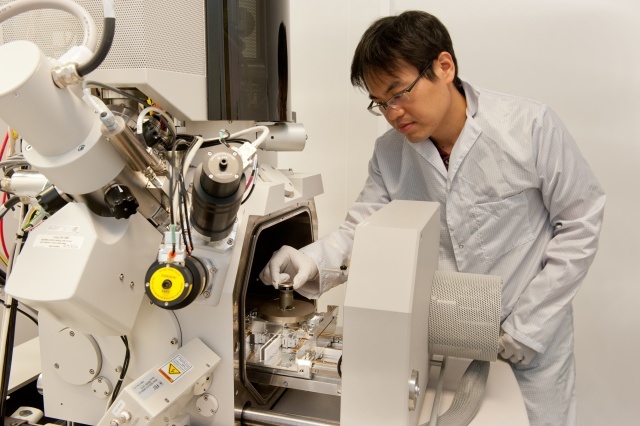 The finding results from a major initiative funded by the Engineering and Physical Sciences Research Council (EPSRC) targeting the development of a new generation of nanotechnology-enabled materials. Equally applicable to other metals such as silver and aluminium, this breakthrough opens up the prospect of colouring metals without having to coat or chemically treat them. This could deliver valuable economic, environmental and other benefits. The technique could be harnessed in a wide range of industries for anything from manufacturing jewellery to making banknotes and documents harder to forge. “This is the first time the visible colour of metal has been changed in this way,” says Professor Nikolay Zheludev, Deputy Director of Southampton’s Optoelectronics Research Centre, who led the project. The precise shape and height or depth of the patterns determine exactly how light behaves when it strikes the metal and therefore what colour is created. The technique can be used to produce a wide range of colours on a given metal. A silver ring, for example, could be decorated with a number of different patterns, making one part of it appear red, another part green and so on; metal features with sophisticated optical properties that would be almost impossible to imitate could be incorporated into documents as security features. The nano-patterning is carried out at the research level using well-established techniques such as ion beam milling, which may be envisaged as sand-blasting on the atomic scale. However, the concept may be scaled for industrial production using such processes as nano-imprint, whereby large areas are stamped out from a master template in a manner comparable to CD/DVD production.